Joint aspiration or arthrocentesis is the procedure by which joint fluid is withdrawn using a needle. The fluid withdrawn is used in diagnostic tests. Arthrocentesis could also be used for therapeutic purposes. Analysis of the joint fluid can enable the physician to differentiate between various joint pathologies. Joint aspiration is a quick, inexpensive procedure and can be performed in outpatient settings. Some deep joints like hip joint or joints of the spine should be aspirated under ultrasonographic guidance for improved accuracy. Repeated aspirations can be used to relieve discomfort and prevent joint damage and is considered as part of the management of a septic joint. Aspiration in cases of hemarthrosis can prevent adhesions. 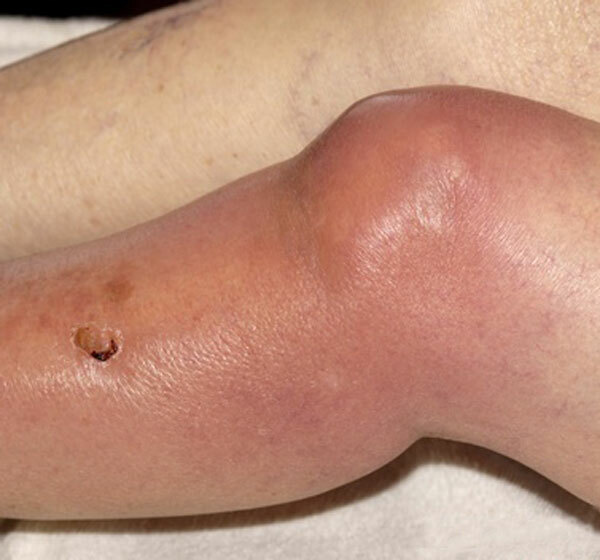 Aspiration can be performed immediately prior to injecting intra-articular medications. Unless there is a strong suspicion of septic arthritis, a needle should not be passed through an area of infection (eg, overlying cellulitis) to avoid seeding of infection. Patients who are on anticoagulant therapy or have a bleeding condition like hemophilia or thrombocytopenia are at increased risk for hemarthrosis with arthrocentesis. Whenever possible, aspiration should be delayed until the coagulopathy is reversed. The joint landmarks are palpated, and the insertion point is marked with ink. The area is prepared with povidone-iodine solution and allowed to dry. The iodine can then be wiped away from the needle insertion site with an alcohol pad to prevent irritation. Chlorhexidine can be used in patients allergic to iodine. If desired, 1% lidocaine without epinephrine can be instilled into the skin and subcutaneous tissue. Some surgeons prefer using spray. The position of the patient may be lying or sitting, depending on the joint and preferences of the surgeon. The joint to be aspirated is positioned depending on the joint type. Change the syringe without removing the needle from the joint and without disturbing the needle’s position. The shoulder joint is usually aspirated in the sitting position. With the patient in a seated position, the arm is held comfortably at the patient’s side and externally rotated. The coracoid is palpated, and the needle is inserted approximately 1.5 in. laterally and 1.5 in. inferiorly. Alternatively, the shoulder can be approached posteriorly by inserting the needle inferior to the acromion. The wrist is held in a straight line with the forearm. A dimple is palpated dorsally over the radiocarpal joint, which serves as the entry point for the needle. The needle is held perpendicular to the forearm and inserted dorsally. With the elbow in 90° flexion. The olecranon process, the lateral epicondyle, and the radial head are palpated. The needle is then inserted laterally into the triangle formed by these three structures. With the finger flexed, the needle is inserted dorsally and either medial or lateral to the extensor tendons. The knee is slightly bent and the needle is held perpendicular to the leg. The needle is inserted medially beneath the patella at approximately the 2 to the 3-o’clock position. A lateral approach is also used in some cases. if required, the prepatellar pouch can be emptied by gently applying pressure and squeezing the soft tissues. The ankle is held at 90° or slightly plantarflexed. A space medial to the tibialis anterior tendon or space palpated between the lateral malleolus and extensor digiti minimi can be used to approach the joint. The toe is held slightly flexed. The needle is inserted dorsally and either medial or lateral to the extensor tendons. Can be avoided by understanding the joint anatomy and avoiding further advancement of the needle into the joint space once synovial effusion enters the syringe. and can be managed with observation alone. With aseptic technique, the risk is negligible. In case the infection has occurred, it needs to be treated with antibiotics. Prophylactic antibiotics can be given where there is an increased risk of infection.